A massive rescue operation is under way to reach stranded people in the flood-hit southern Indian city of Chennai (Madras). More than 2,000 people have been rescued by the army, while the navy has decided to deploy a warship carrying divers, boats and relief material. The city's airport will remain closed until Sunday and train services are suspended. Three days of fresh rains have again led to massive flooding, inundating homes, hospitals, roads, railway tracks and the city's airport. Prime Minister Narendra Modi has tweeted that he was "leaving for Chennai to take stock of the situation arising due to the devastating floods". Schools, colleges and factories are shut, exams postponed and power supply suspended in most parts of the city. 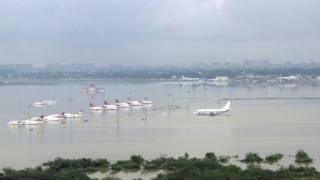 Authorities said all flights to and from Chennai have been cancelled as the city's international airport will remain shut until Sunday. A naval air base at Arakkonam, 70km (43 miles) from the Tamil Nadu state capital, will now be used as an alternative airport for relief operations. "The biggest challenge is to find a way to clear the inundated airport and main roads," Anurag Gupta of the National Disaster Management Authority told the Reuters news agency. The federal weather office has predicted three more days of torrential rain in the southern state, where nearly 70 million people live. "There will be no respite," weather official Laxman Singh Rathore told reporters. A total of 269 people are now known to have died in floods in Tamil Nadu state since last month. Are you in Chennai? Have you been affected by the flooding? Let us know about your experiences. Email haveyoursay@bbc.co.uk with your stories.